Happy Perfect Picture Book Friday, Everyone! Grab a fortifying snack (perhaps a potpourri of Robin’s Eggs, jelly beans, chocolate eggs, and marshmallow peeps to get us in the mood for this weekend :)) and let’s dive into today’s wonderful selection of picture books! My book today is actually one I’ve never read! I’m posting a PPB from Cheryl Ashley, the children’s librarian at Verona Public Library in New Jersey. This is one of her favorites, and I don’t know of a much better resource for recommendations than a children’s librarian so I, for one, am going to hustle on out and read this! And what better for Easter weekend than a spring farm story? Nobody ever thought she’d try it! There wasn’t any more peace and quiet. Why I Like This Book: (from Cheryl): This longtime favorite was written in 1990 and is available in paperback today. The story of the dreadful day the goose got loose is told in near perfect rhyming that will have youngsters bopping their heads keeping time. The text almost needs to be sung, it is that rhythmic. Among other mischievous deeds, goose ate the hens grain, frightened the sheep, enraged the ram,inspired the horses to get up to no good, made the cows tense, provoked the bull named Spence, annoyed Dad and upset Mom. The pictures are a riot. This silly story is a feast for the eyes, ears and funny bone. Thank you so much for sharing your recommendation with us, Cheryl! Still got some jelly beans left? Good. Because we have a few more items of interest. If you haven’t had a chance to vote on the March Pitch Pick, please hop over HERE and vote for which pitch should get a read and critique from editor Erin Molta. In World Tour News, Phyllis had a delightful visit to Debbie in South Dakota where she made friends with a bison and was interviewed by a very cute dog named Sherlock! She is currently with Melissa in Australia and on her way to Alison in Georgia. She is also lost in the UK somewhere between Rebecca and Clare… I have no idea…! She has also been to Vermont, and that post will be up sometime this weekend from Kathy! Be sure to check back here to the Tour Page, and I will also post any new links on Face Book as soon as I get them! In contest news, I’m still on the fence, so I’m going to let you decide with the click of a button! I’m very democratic around here 🙂 You can vote until 5 PM EDT on Easter Sunday, April 8. Oh Susanna – What Should A New Author Look For/Watch Out For In A Contract? Great pick, Cheryl! Children's librarians are such awesome folk. This book is right up my alley. (Little bowling talk there) The text is beautiful. I imagine I'll laugh out loud as I read this book. (I love to laugh.) I'll look for it at our bookstore on Saturday. Thanks Susanna. Hope you get to rest up this weekend, pal. Happy Easter. I've read several of the posts on Phyllis' tour…so much fun! Glad to know you love this story, Vivian – another vote of confidence for it! Please don't worry about missing some PPBF visits. It's a lot to do every Friday and we all just do the best we can – me included. You can only do what you can do, and sometimes something has to fall by the wayside. It's OK 🙂 You're here today 🙂 And I'm glad to see you 🙂 P.S. Glad you're enjoying Phyllis's tour. If you know other teachers, please spread the word about the tour and the Phlat Phyllis idea 🙂 And glad your school visit was successful! I have to check out Phyllis' page to make sure I've seen all the awesome places she's been! Ic an't believe all the places she's gotten to go! The book sounds hysterical! What a great idea to ask a children's librarian for a PPBF pick! Glad you like the book, Robyn! There will be no resting up, though – I'm way too far behind for that 🙂 Have a great Easter! I don't deserve the credit for asking, Erik – Ms. Ashley offered! And yes! Definitely check up on Phyllis when you get a chance – she's been having lots of adventures! I'll have to catch up to Phyllis this weekend, and have a wonderful Easter break!!! I'm loving the updates from Phyllis' tour. Unfortunately I haven't read any of the posts. Even with planning ahead, the A to Z challenge posts are what I've been trying to keep up with and that's tricky! That said, my vote in the poll was for May. What a fun book! Thanks for sharing and have a great weekend! Rhyming with loose farm animals – I will definitely be looking out for it. So I missed the details, what's the birthday contest? Hmm. I've been jotting down birthday ideas since you posted. Of course, it's the first week in A to Z and boy do I feel behind already. Relatives here for the weekend. I'll have to figure out times to sneak away to the computer or look distracted on the iPhone or iPad to read all of this week's entries. Looks like a fun list so far. This book sounds familiar but the author is not who I thought from reading the synopsis. I'll let you know later who it reminds me of. It's hilarious. What kid wouldn't like it? I have a birthday story since my youngest was born on April 21 but I'm much to busy to write it so I voted “not now”. I've already opened up the Robin's Eggs, now I must locate “The Day the Goose Got Loose.” I love the rhyme. By the way, the boys enjoyed “Kiss the Cow.” PPBF is definitely my favorite day of the week. This sounds like a great book for the grandkids. More than one bag of candy is open in my closet… just sayin' 🙂 So glad your boys liked Kiss The Cow, and you have made my day a happy day by saying you love PPBFs!!! Have a great weekend! Fair enough – that's why I put up the vote. I only want to run a contest this month if people want to do it! Would you do it in May? I'm glad you're enjoying Phyllis's antics – I am too!!! Can't wait to see what she gets up to when she visits you in VA! I think it is great that you had a librarian offer a recommendation and post for PPPF! Great rhyme and I recognize Steven Kellogg's illustrations on the cover! I know! I'm so glad to have her recommendation! I didn't ask – she offered as she doesn't have a blog. I recognized that art right away too – so distinctive! The goose would be wise to steer clear of that bull! I have taken to reading PPBF posts with one tab open to amazon so I can keep a running list of the books that appeal to me. I tell my family it's research for work, otherwise I sound like a picture book junky 😉 Thanks,Susanna, I'm off to raid the bag of robin's eggs. 🙂 I appreciate the understanding! I will continue to spread the word about PPBF and Phyllis! Thanks for voting Tracy. And yeah – A To Z is fun, but it makes for A LOT more post reading then usual – hard to keep up! The Day the Goose Got Loose sounds hilarious! I really enjoy a book when the rhyming is really good — kids bopping their heads to the beat! What a great Spring pick. The cover is priceless! I actually have a rather scary childhood memory of being chased by an unpredictable goose…so would you believe that I find them a bit frightening? A goose on the loose sounds like my worst nightmare 🙂 lol. I'm sure there are lots of funny moments in this one, thanks for the recommendation! That is so funny! Another friend of mine, who coincidentally is also named Amy! also got chased by a goose! How weird is that?! This book sounds very funny. Loved the review. the cover says it all. Have a Book Review for PPBF but not sure what you think as I was in two minds to post it. I now have, and sent you an email with the link. Thanks Susanne. It does look fun! And I got your link! So true! And thanks for voting. It's looking like it's going to be May. I looked for The Day the Goose Got Loose on my library run yesterday afternoon. It wasn't on the shelf, but they have it. I need to put it on hold. It sounds great. I voted…I love your contests so I'm sure I'll find time no matter when. 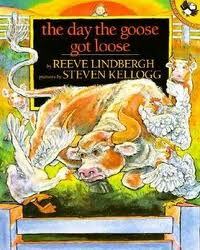 “The Day the Goose Got Loose” sounds like a winner, with the way the blurb was worded, and the funny animal pics. Thanks, Tina! Happy Easter to you too! Oh man, I've missed out on so much blogging this week. 😦 I love the book you shared today though. My kids would LOVE it! They are all about farm animals and chaos! Sounds like fun! Hope you've had a great weekend!